Grow PA is a statewide initiative that convenes people and organizations throughout Pennsylvania to advance a modern growth agenda. Over the last few decades, Pennsylvania has been on the decline. With a shrinking workforce, stagnant population and underperforming economy, the Keystone state is failing to keep pace with the rest of the nation. These trends are shaping our state’s future. Without growth in population and jobs, this downward course will continue to impact Pennsylvania’s long-term vitality. 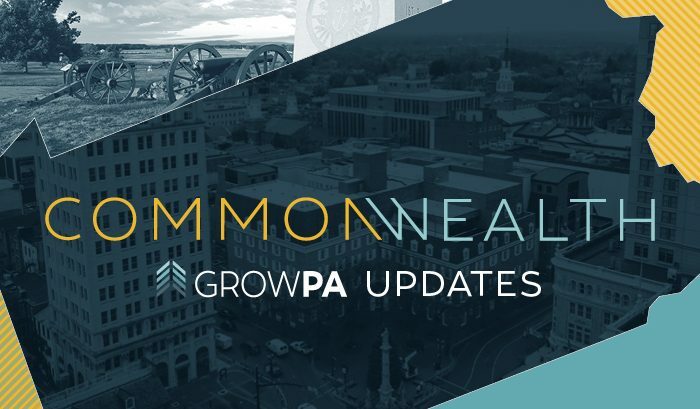 In response to this decline, chambers of commerce, trade associations, and business and civic leaders from across the state have been working together on an initiative to reverse our trajectory and advance the Commonwealth — called Grow PA.
Grow PA began in the fall of 2017 as a virtual discussion among stakeholders from various sectors of our business and civic community through a digital forum to share stories of innovation from around the state. Over the past year, Grow PA has evolved into a movement focused around three pillars, working to modernize all facets of our infrastructure, accelerate health care innovation, and transform post-secondary education. To transform post-secondary education, we must prepare our students and citizenry for 21st century jobs and create new pathways for lifelong learning. Updating and upgrading our transportation, ports and airports, water treatment systems, pipelines, and telecommunications is vital to growing our economy. Identifying challenges and opportunities in health care is key to being able to attract, support, and accelerate innovations that improve health care delivery. Grow PA has gathered thousands of advocates and collected hundreds ‘big ideas,’ focused on each of these pillars and ensuring long-term growth for the Commonwealth. From this list of ideas, Grow PA advocates have selected a series of priority recommendations that fall within each of these three pillars and form the Grow PA 2019-2020 Legislative Priorities. Promote private investment in 21st century broadband networks to support industries and economic development. For rural areas, target funding to unserved locations where the market has not supplied adequate broadband. Utilize competitive funding processes to deploy technology to underserved areas and consider ways to coordinate state and federal funding to have the most impact. Expand public private partnerships to modernize infrastructure to support a range of statewide improvements including water, wastewater, roads and bridges, transit, utilities, and fiber networks. Build a network of clean energy infrastructure that includes electric vehicle charging stations and CNG and LNG fueling stations statewide. Improve energy resiliency with increased microgrids helping rural areas meet their energy demands. Advance implementation of a Vehicle Miles Traveled (VMT) program and/or special fee to capture costs of hybrid and electric vehicles and establish a stable source of funding for transportation. Expand natural gas infrastructure and technology to enable access to low-cost energy for residents and businesses across the state. Invest in parks, forests, and land to restore deteriorating infrastructure and promote place-making. Expand access to telemedicine services with particular focus on rural areas in conjunction with broadband development. Modernize public sector services, while promoting innovation and growth of private sector employer-sponsored healthcare. Promote job apprenticeships, or employer-sponsored programs that include mentored, on-the-job learning, resulting in an industry-recognized credential for semi-skilled workers in healthcare. Establish a Pennsylvania Enterprise Fund (PEF) that awards grants to companies in healthcare and research to incentivize those creating jobs and driving innovation to locate in Pennsylvania. Enact statewide Centers for Excellence that address the needs of the state’s aging population. Incentivize new graduates who enter into the healthcare sector to remain in Pennsylvania. 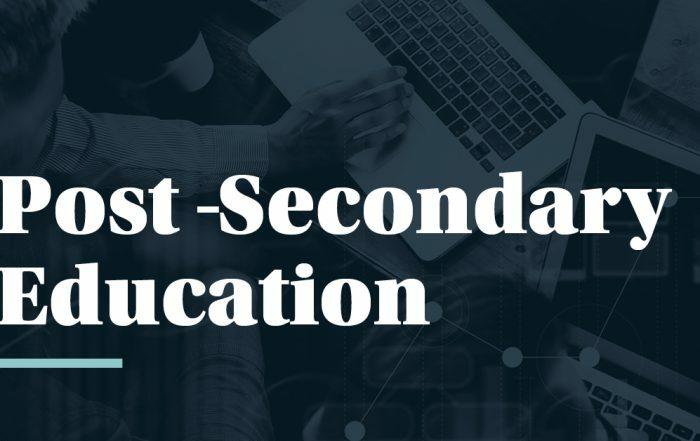 Connect high school students to post-secondary alternatives such as technical schools—and provide incentives to pursue those alternatives. Support career readiness and understand employers’ needs by providing real-time job market analysis to educate students and post-secondary institutions. Develop a student-loan forgiveness program for students who remain in the state and pursue careers in high-growth industries. Implement strategies to encourage and support immigrant and first-generation students to succeed in post-secondary education. Issue an innovation bond to fund investments in Pennsylvania’s educational and medical research facilities. Modernize the role of State System of Higher Education to support life-long learning. Provide incentives for students pursuing disciplines in information technology. Over the last year, we’ve traveled across the Commonwealth gathering what we call ‘big ideas’ to help grow Pennsylvania. Our list of legislative priorities originates from these big ideas focused on advancing keys to growth—infrastructure, health care, and post-secondary education. Make Pennsylvania the center of research, innovation, and construction around autonomous vehicles. Invest in recreational assets in downtown areas. Examine opportunities to privatize state-owned infrastructure. Connect underserved neighborhoods via bus and rail lines. Support development and deployment of highly automated vehicles (HAVs). Increase investment in the Port of Philadelphia to support increased exports of Pennsylvania goods. Create co-ops for energy grids that communities can build from. Support a hyper-loop from New York to Washington, D.C. with stops in Philadelphia to accelerate rail travel and commute times. Further dredge the Delaware River to allow for big shipments of products from around the globe. Build a second level to the Schuylkill Expressway and other congested roadways in Pennsylvania. Toll the upper deck for a speedy commute and let the lower deck be “free” and subject to congestion. Develop fueling infrastructure at ports to prepare for converting 2,500 high-sulfur diesel cargo ships to natural gas. Further incentivize Combined Heat and Power as part of Pennsylvania’s overall energy growth policy. Develop state credits/grants for consumers switching to cleaner burning natural gas for residential, commercial and industrial heat/power needs. Create tax credits for “behind the meter” fuel conversion to natural gas. Expand “last mile” infrastructure development to reach residential users. Create District Energy Zones where long-term Power Purchase Agreements would incent use of natural gas-fueled micro-grids for manufacturing facilities. Establish a production-based tax credit for manufacturers. Support site developer incentives for infrastructure expansion to get the gas to sites manufacturers want to occupy. Connect state, business and academia to make the state a new epicenter for plastics innovation, sustainability and recycling, and carbon fiber R&D. Establish a production-based tax credit for advanced materials manufacturers, such as additive manufacturing (3-D printing). Move forest product and manufacturer and finish products closer to state since PA has the raw material. Create a 100% transferable pass for all transit networks statewide. Commit to building autonomous vehicle lanes throughout the state. Increase state support of logistics for port and rail. Leverage existing aviation infrastructure to establish commercial drone networks, hangers that are best in class. Take advantage of our forest products and market biofuel development. Allow local tax clustering to fund local transportation projects. Develop enabling legislation to all for local funding options for local infrastructure needs. Collaborate with post-secondary education institutions to create an investment fund for entrepreneurs with a focus on healthcare innovation. Encourage licensing and certification requirements for healthcare professionals to include artificial intelligence-based medical education systems and simulation-based practicums to develop highly skilled healthcare providers. Encourage innovation that increases patient interaction and involvement. Support long-term intervention and care for those afflicted with addiction. Utilize predictive modeling to improve coordination, identify patients who need help most urgently, and help avoid unnecessary hospitalizations through a combination of preventive care and encouraging home care when appropriate. Look at global market trends to diversify health care research. Leverage artificial intelligence and big data to revolutionize the care model. Increase the number of incubators and co-working spaces in rural communities. Combine medical research with financial partnerships that yield breakthrough products to improve care. Healthcare institutions should collaborate across all academic disciples. Expand the Facilitated Health Networks (FHN) framework. Enable access to all of an individual’s healthcare data. Promote medical marijuana dispensaries to create jobs in both agriculture and health care. Teach students about becoming community health workers. Innovate around “whole‑person” approaches to healthcare that address issues like opioid addiction. Incentivize healthcare employees and new graduates to stay in Pennsylvania. Utilize educational institutions to be leaders in addressing the needs of older Pennsylvanians. Transform the state into a leader in medical marijuana research and development. Ensure internet access in all rural areas to connect home healthcare through telemedicine, offer better healthcare delivery, and provide educational opportunities for jobs in healthcare. Expand workforce and training of mental healthcare professionals. Build better partnerships with employees and students to encourage STEM. Encourage partnerships and placement of Venture Capital firms near life science businesses to promote innovation and attract young people. Develop a fund to attract and retain life science companies in Pennsylvania and create a P3 to establish Keystone Healthcare Innovation Zones. 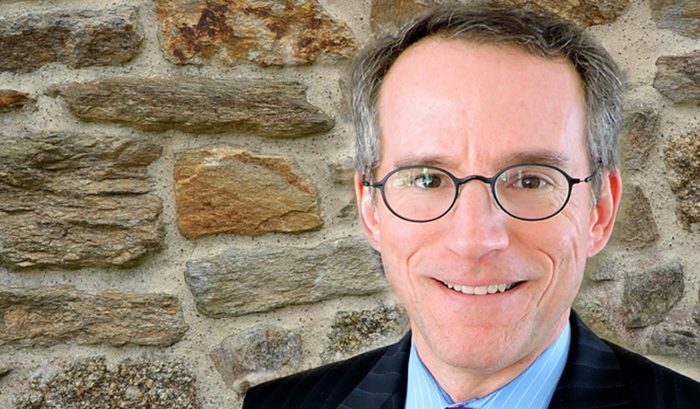 Create a marketing strategy around wellness to attract millennials to Pennsylvanians. Coordinate clinical trials among specific pockets of healthcare entities to mitigate barriers to access. Significantly invest in research and development by holding a statewide referendum on an Innovation Bond to invest in Pennsylvania’s eds & meds facilities and infrastructure. Improve the connections between high schools, colleges and local companies, and making sure their programs align with what companies are looking for, especially with regard to trade skills. Provide grants for STEM and technical training programs in order to build a relationship between STEM and the workforce. Expand Pennsylvania College of Technology (PCT) efforts that have helped students achieve nearly 100 percent employment through the development of the Plastics Innovation & Resource Center (PIRC) focused on innovation, research and development, and job training. Provide more startup funds and encourage students to get involved in the startup ecosystem. Provide development and digital credentialing solutions for the evolving workforce. Create tax credit programs that incentivize startup activity. Develop a millennial recruitment strategy for 3rd class cities to market affordability, quality of life issues to new graduates. Provide high school students exposure to post-secondary alternatives and provide incentives to pursue those alternatives. Increase college affordability programs by advocating for the Pennsylvania Higher Education Assistance Agency (PHEAA). Reform the prevailing wage in Pennsylvania. Develop a statewide dual enrollment plan to ensure equal access for all students. Support career readiness and understand employers needs by providing real-time job analysis to educate parents, students and college and career counselors. Develop a statewide framework that incentivizes the merging of private liberal arts institutions. Support a robust infrastructure system to reach the state’s institutions. Support infrastructure investment in broadband access. Develop satellite campuses for community colleges on University campuses. Incentivize or activate employees to create student training for careers by sharing best practices, incentivizing paid internships and crediting businesses for helping students. Encourage career readiness by making the fourth year of college as an off-campus co-op experience. Develop manufacturing apprenticeship programs, where student-employees can “earn and learn,” becoming credentialed for a professional career while earning a paycheck. Develop programs to help individuals navigate the digital divide by developing training programs that will have to transition out of manufacturing or other fields that have downsized, or on industries that are becoming obsolete. Grow PA is a statewide initiative organized by the Chamber of Commerce for Greater Philadelphia that convenes people and organizations throughout Pennsylvania to establish a modern growth agenda. 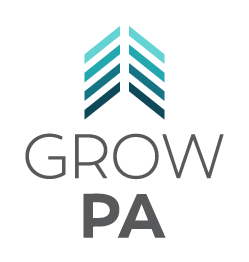 For more information on Grow PA or to get involved, contact a Grow PA team member at 215-790-3793 or growpa@chamberphl.com.